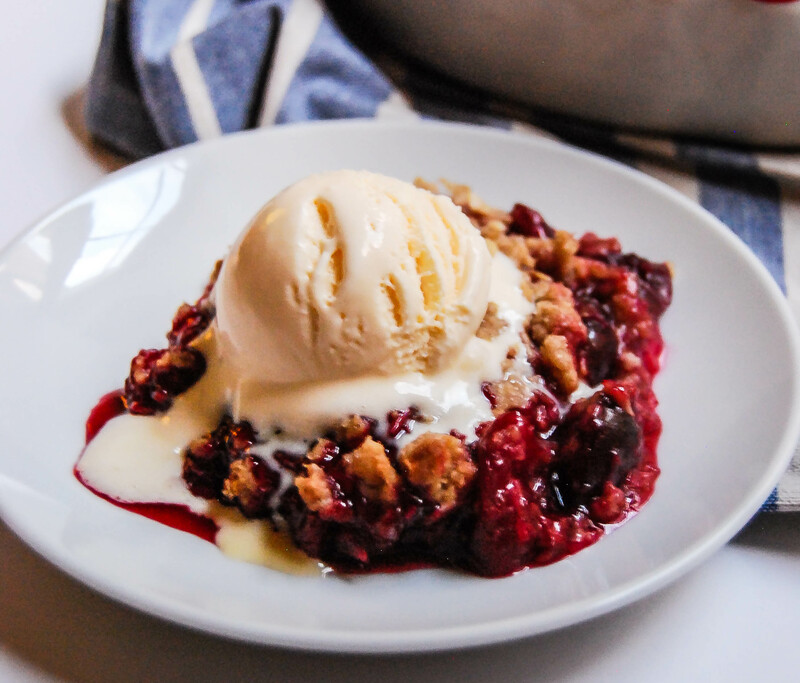 Sweet cherries and tart rhubarb are the perfect pair in this cherry rhubarb crisp recipe. You’ll love the gingery crumble topping too! I still remember the first time I ever had rhubarb. I was in high school, probably 15 or 16, and my friend’s dad had offered (very bravely, I might add) to take his 2 daughters and 5 of their friends to the north woods of Wisconsin for a week. Us girls had a blast in our little cabin. We spent the week boating, tubing, making bonfires, and playing Bingo in town. At some point, we passed a little shop on the side of the road where they were selling homemade pies. Of course, we stopped by and picked up a few different flavors and some ice cream too! We promptly ate big slices of pie for dessert that night, and for breakfast the next day. I have always loved a good fruit pie. And my friend’s dad promised us we were going to love the strawberry rhubarb pie, even though I was dubious of this vegetable (?!) I had never tasted before. And oh, my rhubarb! I fell in love with the sweet, tart, juicy goodness of that pie! Where had you been all my life, rhubarb?? And how could a vegetable which looks distinctly like a reddish version of celery be so wonderfully delicious? My life was changed. Now, every spring, I make my favorite strawberry rhubarb pie with crumb topping. It’s delicious and while I do share, I always make sure I end up with extra slices for myself! This year, I’ve been in love with cherries, and after making my pie, I was also really interested in combining rhubarb and cherries. One evening while the hubby was out with his friends, I spent the night making (and eating) this cherry rhubarb crisp. There are subtle flavors of ginger and lemon in both the crisp topping and the fruit filling. And I added some coconut in the crisp topping for some extra texture. You’re going to love it! Like all crumbles and crisps, it is lovely warmed, with a big scoop of vanilla ice cream on top. Combine all fruit filling ingredients in a medium bowl, mix until juices begin to release, and set aside. Combine flour, oats, coconut, sugars, and spices in another medium size bowl. Add butter cubes and, using your hands (or a pastry blender if you prefer), quickly work the butter cubes into the mixture until incorporated. Mixture will be crumbly. Stir fruit mixture again and pour into a large pie dish, or a square 8x8 baking dish. Sprinkle crisp topping evenly over the fruit mixture. Bake in preheated oven for 35 minutes, or until topping is golden brown and juices from fruit are bubbling on top. Let cool in pan for at least 15 minutes. Serve warm, topped with vanilla ice cream if desired. Loved this! I just made it for my dad’s birthday and it was a hit. Not to sweet, nor not too tart. Yay, I’m so glad you enjoyed it! I’m desperately awaiting the return of rhubarb season.